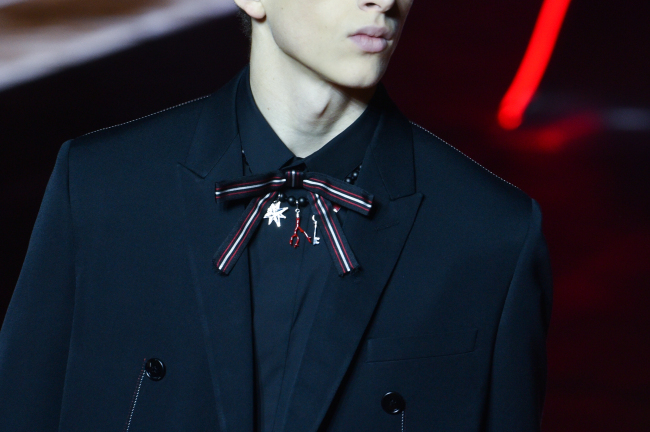 PARIS (AFP) - When Kris Van Assche was designing the new Dior menswear collection, he had a very specific person in mind, he told AFP Saturday as it debuted on the Paris catwalk. “It‘s a young Parisian who creates a skate park in the 800-square-meter apartment he lives in a (historic) Haussmannian building,” the Belgian designer said. Mere mortals may wonder if such a person really exists -- most families in the city would be happy to live in a home a tenth of that size. But the idea perfectly chimes with classy yet emphatically street clothes that van Assche showed at a star-studded show where Hollywood royalty like Christian Slater and his co-star from the hit TV series “Mr Robot” Rami Malek rubbed shoulders with Harlem-born rapper ASAP Rocky. You could certainly see the sons of the one percent in the procession of snazzy black suits with a distinct Wild West cut and string ties, or the red overcoats that seemed to be channelling the raffish charm of gambler Wild Bill Hickok. Van Assche said he took his new dark-and-dangerous-to-know look -- a big departure from the bright and flowery colours of his previous more “bourgeois” collection -- from a mix of '80s New Wave music, the Berlin of electronic pop pioneers Kraftwerk and skateboard culture. In case you didn’t get those influences, WestBam's “You Need The Drugs” was playing as guests were led into the show’s set, the world‘s blingiest skate park lit by a huge red chandelier and ramps edged with red neon. With long sleeves that almost become mittens, Dior has mostly resisted that baggy giganticism that has been seen a lot elsewhere in Paris this week. Van Assche did however combine big baggy belted trousers with Scandinavian knit jumpers and hoodies, although most of the trousers with his more tailored pieces were short and close-fitting to showcase red-laced shoes. “It is good to have certain references, but we mustn’t abandon ourselves to that nostalgia, it won‘t get us very far,” he said. His last collection full of the white rose Dior motif was “particularly colorrful for me,” he said. And it seemed to go down well with his celebrity guests. Korean K-pop star T.O.P said he “loved it” while Chinese movie heartthrob Yang Yang was equally taken. “It’s great,” he said. 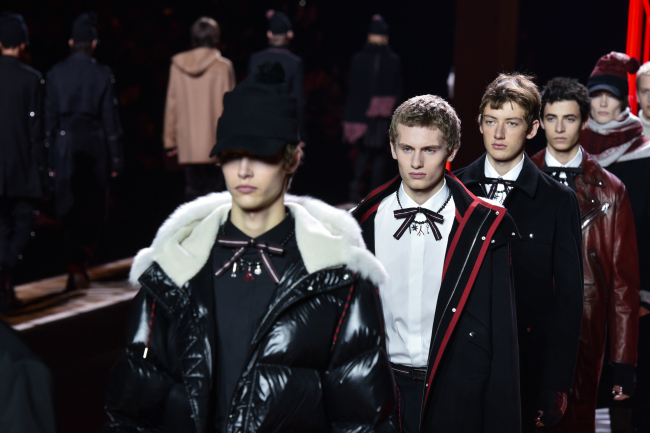 Van Assche denied, however, that the collection‘s heavy reliance on black and other sombre colors was a reflection of the mood in Paris after the terror attacks. “I have never found that black was about darkness. I think there is a lot of beauty and romanticism in it,” he said. Earlier the Paris-based label Etudes -- whose studio is near the Bataclan concert hall were 90 people died in November’s attacks -- seemed almost to be on a war footing, with a collection largely comprised of military-inspired and camouflage outfits, fighter pilot fatigues and parachute suits.